It's been a good period for me as far as travel is concerned. I visited Goa last month. It was my third trip to Goa, so the destination was not something I was looking forward to visit, but it was a road trip, and I love road trips especially during monsoons when the roads look more beautiful with various shades of green all around them. I was with two more friends in our car, a lady driving. So all those who think that ladies cannot drive should meet my friend. It was one of the best roads trips for me for various reasons - I have rarely travelled on ghats during monsoon. Lonavala trips no longer fall in the road trip category as thanks to the Express way, you don't get to enjoy the ghat section. But the roads are beautiful nevertheless. 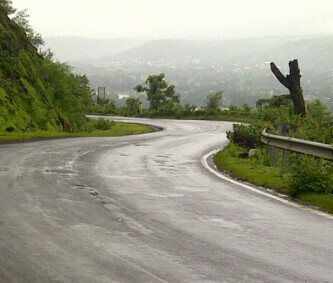 And I did visit Lonavala using the ghat route as it was a bike ride. But more on that, later in the post. Road to Goa - one of the best patches that we drove on. Goa stay was very relaxing too. I was resting most of the times. The resort was beautiful. It had a private beach and other amenities that you would prefer when you go for a vacation to rest. While coming back, we took the Kolhapur route. It had only one ghat - Amboli ghat. Rest of the route was express way. But those twenty minutes on Amboli ghat left me with unforgettable memories of the ghat. This was the road that we drove on for twenty odd minutes. There were some 25 odd waterfalls on this ghat. Another trip was to Lonavala by bike. Again, it's a different fun to travel on ghats on a bike and in a car. You cannot compare both the experiences. I don't click much when I travel as I prefer to enjoy the journey more than capturing the memories. I like the memories more in my head. But I do have a few pictures of that trip, one of them is going to be my favourite for quite some time after the one I posted above. You can see me too in the mirror. This was the road for sixty to eighty kilometers one way. While returning, it was pouring. Again it's a different fun to get drenched in rains when you travel by car and by bike. Yesterday I went to Kolad for river rafting. That was one great experience too. One of the best outdoor activities I have done. But more on that, some other time. Seems to be holiday,excursion time for you. I can understand how good oe would feel on this route.I have travelled to Goa on this route by road.It was a nice drive....but it wasn't during monsoon. May you have such fun always. You have brought back a lot of memories of my travel by road in hills,also Ghats between Mumbai & Pune. OMG ! I am as green as the grass in the abve pics ! Oh yeah I love travelling by road. It makes you feel free and you can stop anytime and savour the beautiful view. I recently went to Ratanagiri by road and had a really great time. You have captured really beautiful pics. A suggestion, do put bigger pics as people can see things much more clearly. Roads trips are awesome if you have a good driver! And you sure had a good time! Lovely captures and awesome views. Rafting is Super Fun!! Pics of the rafting trip?? Goa is my favorite destination. Been there twice and planning for another trip this year.Amazing pictures there! This is like WOW!!! We have been thinking/planning for a holiday for months now and it hasn't happened yet. Hopefully, we will make a small road trip to Agra and Mathura, if nowhere else! I have gone on numerous road trips. Being the navigator; I get to look at the scenes around and also nag for stopping the vehicle to take a pic or two :) See these pics earlier; once again, no amount of camera capture can do justice to what your eyes took in! photos look cool :) Will we be able to take bath in those streams and falls??? Thanks for the nice write up. So far, have not visited either Mumbai or Goa. These 2 are in our definite visit list during our next trip in 2013.